In today's turbulent world it's hard not to feel like we're going backwards; after decades of striving, justice and equality still seem like far off goals. What keeps us going when times get tough? How have the leaders and unsung heroes of world-changing political movements persevered in the face of cynicism, fear, and seemingly overwhelming odds? In The Impossible Will Take a Little While, they answer these questions in their own words, creating a conversation among some of the most visionary and eloquent voices of our times. Today, more than ever, we need their words and their wisdom. In this revised edition, Paul Rogat Loeb has comprehensively updated this classic work on what it's like to go up against Goliath--whether South African apartheid, Mississippi segregation, Middle East dictatorships, or the corporations driving global climate change. 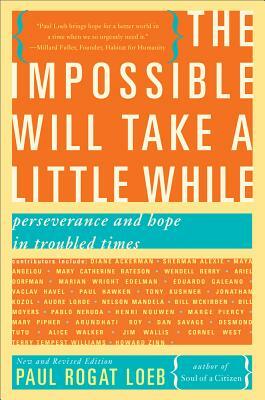 Without sugarcoating the obstacles, these stories inspire hope to keep moving forward. Think of this book as a conversation among some of the most visionary and eloquent voices of our times--or any time: Contributors include Maya Angelou, Diane Ackerman, Marian Wright Edelman, Wael Ghonim, Václav Havel, Paul Hawken, Seamus Heaney, Jonathan Kozol, Tony Kushner, Audre Lorde, Nelson Mandela, Bill McKibben, Bill Moyers, Pablo Neruda, Mary Pipher, Arundhati Roy, Dan Savage, Desmond Tutu, Alice Walker, Cornel West, Terry Tempest Williams, and Howard Zinn. Paul Rogat Loeb is the author of Soul of a Citizen, which has 130,000 copies in print. He appears regularly in the Huffington Post and on national radio and TV and has written for the New York Times, Washington Post, and AARP Bulletin.